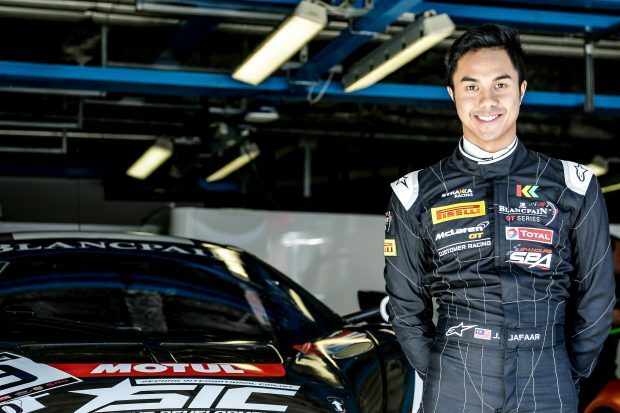 Leading Malaysian racing driver, Jazeman Jaafar, heads to Silverstone circuit, the home of British motorsport, for the second round of the Blancpain Endurance Series this weekend. The British round of the Endurance Series is the home race for Strakka Racing, the team fielding four McLaren 650S GT3s in this championship. Jazeman, a McLaren Academy Driver, shares the #59 car with 27 year old British driver, Dean Stoneman and 22 year old Andrew Watson from Northern Ireland. Jazeman and his teammates have prepared for the weekend with a test session on Monday, giving them an opportunity to develop the car set up for the famed Silverstone circuit, one of the oldest Formula 1 circuits. With a field of around 55 cars, expectations are high for fast, highly competitive racing. The event is the home race for both Strakka Racing and McLaren, a leading British sportscar manufacturer, so the team is hoping for a strong performance in front of the passionate and very knowledgeable British fans. The weekend begins with a one hour Free Practice session on Saturday morning at 10.45 and the Pre-Qualifying session at 16.10 in the afternoon. The qualifying session starts at 09.45 on Sunday morning with the three hour race kicking off at 14.55. All the sessions are streamed live on YouTube at the official series channel, GT World.